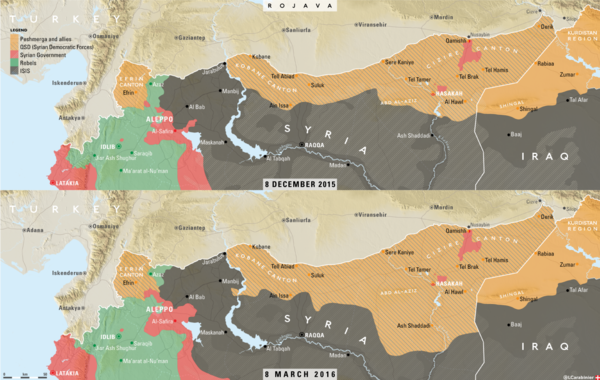 On July 2, 2014, following the conquer of Mosul and large regions of north-western Iraq, the Kurdish region of Kobanê (Arabic: عين العرب‎, Ayn Al-Arab) in central northern Syria bordering Turkey was viciously attacked by Islamic State aka ISIS forces with tanks and heavy weapons brought over from Iraq. According to Kurdish sources, ISIS has fired more than 3,000 mortars in four days. In addition to the 200,000 people living in Kobane canton in peace time, there are currently at least the same number of refugees, mostly Kurds from other northern regions of Syria, taking shelter there. The pattern and the involvement of Turkey follows what has been seen in the eastern part of Syrian Kurdistan since late 2012 with the Assault on Ras Al-Ayn. The border regions with Turkey both west and east of Kobane canton are already controlled by ISIS, including the border posts at Jarablus and Tal Abyad (see Syrian Military Maps). In an "urgent call" for help to the international community on July 6, the Kurdish National Congress (of Syrian Kurdistan) pointed out that the attackers are able to move freely across the border and in Turkey, while the army is turning a blind eye and wounded ISIS fighters are even treated in Turkish hospitals. Already in late May, hundreds of schoolchildren from Kobane went by bus to Aleppo to do their exams, crossing ISIS-controlled territory. On return, they were abducted. ISIS released the female students and younger children, but kept initially 148 13-14 year old ninth grader boys, promising to release them after they'd receive ten days of "Islamic education". Which did not happen, Only a small number were released or managed to flee, and despite protests from several sides even including Human Rights Watch, as of mid-September about 130 of them are still held captive near Jarablus, with reports of heavy indoctrination and light torture. IS began its offensive by first capturing the villages of Zor Mughar, Beyadi and Ziyarete, 40-45 kilometers (25-28 miles) west of Kobani. The YPG pushed IS out of these villages after hard-fought battles. IS left behind more than 100 dead, a Humvee, a tank, some Doushka heavy machine guns and automatic weapons. YPG lost 16 of its fighters. On July 7, the IS target was the Kun Eftar village, slightly north of the Turkish sovereign territory of the Tomb of Suleiman Shah. Here YPG lost two fighters but IS lost 20 to 30. IS could not achieve its goals. 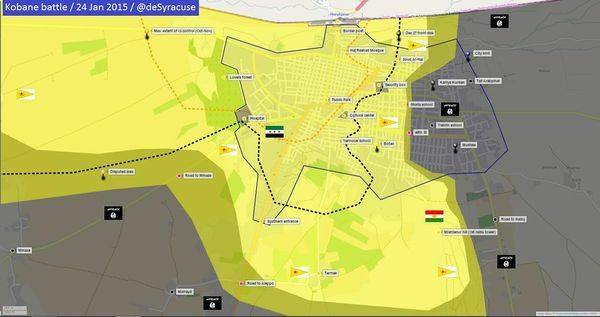 Next came attacks from Tel Abyad in the east. On July 8, IS attacked Evdiko village 8 kilometers (5 miles) west of Tel Abyad. In that clash, six YPG fighters and civilians were killed. Another IS target was Abu Surra village, 60 kilometers (37 miles) south of Tel Abyad. There, IS blew up a bomb-laden truck at a YPG checkpoint, killing four YPG fighters. By July 8, Kurdish officials were speaking of at least one village reclaimed (Zormixar), and 200 ISIS fighters killed, with no word on their own losses. On the same day, Kurdish news agency Firat put the number of killed ISIS fighters at 270, with 21 fighters of Rojava's self-defense militia People's Protection Units (YPG) and one civilian dead on their side. IS encountered the toughest resistance in Syria at Rojava and despite all its efforts, could not overcome it. 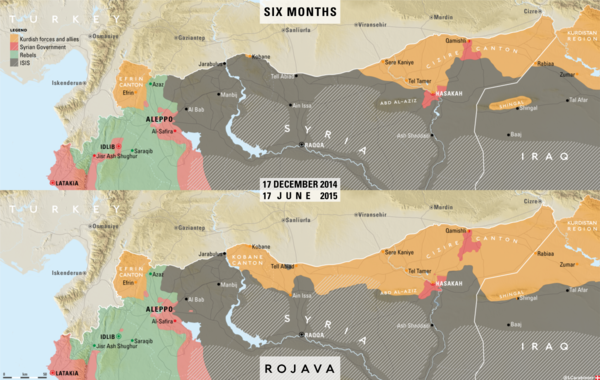 Rojava became a major obstruction to IS. 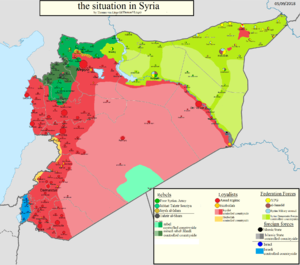 Kobane is the weakest link among three cantons of Rojava, which are not contiguous. 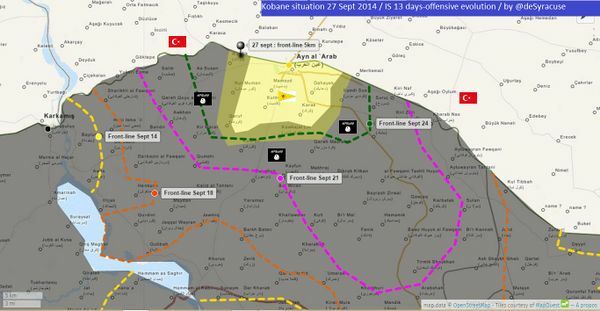 Nassan and all other Kurds believe that by capturing Kobane, the IS wants to wipe out the autonomy project. If Kobane falls, the IS will next target the Mursitpinar border crossing to Turkey to further consolidate its presence on the Turkish border. 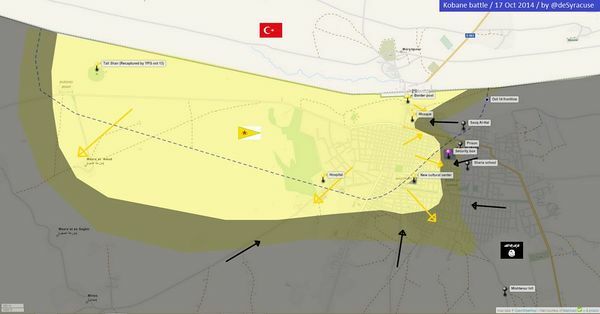 IS cannot establish a land connection between Jarablus and Tel Abyad, which it controls, by using the 85-kilometer (53-mile) road parallel to the Turkish border that links those two towns. They now have to travel 250 kilometers (160 miles) for the same trip. 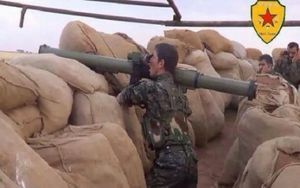 On July 11, Firat reports that the YPG has "for the first time" used anti-tank missiles, destroying an ISIS-manned tank in the village of Carikli. 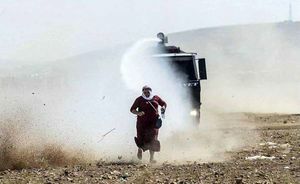 Participants of a solidarity vigil action in the Turkish border village of Ziyaret report that a train carrying Turkish tanks was seen driving through the region with unknown destination. A YPG press release on July 13 states that 61 ISIS fighters had been killed during the last 24 hours in continued attacks on several fronts. In another statement ISIS is accused of using chemical weapons in their attacks. Traces had been found on two dead YPG fighters (photos published with the statement) and a call was made to the international community to come investigate details, as Kobane's situation under siege doesn't give the local authorities access to the equipment necessary to do so. After thousands attended solidarity events on the Turkish side of the border, in the night of July 15, about 300 Turkish Kurds teared down the border fence and crossed into Rojava to join the fight, which continues on three fronts: To the West around Zor Mixar, to the South in the villages on the banks of Euphrates, and to the East around Kendal, Evdıke and Gıre Sor. 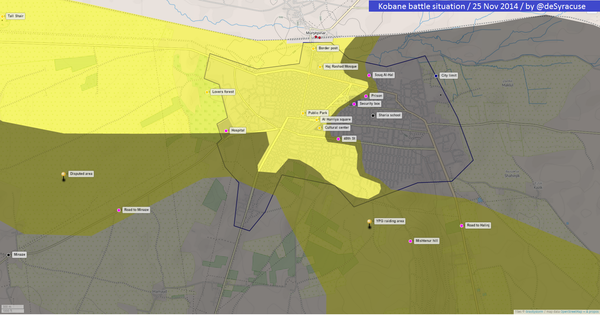 The nearest ISIS came to the city of Kobane is 35 kilometers, while their most powerful mortars reach 25 kilometers. On July 19, tens of thousands gathered on both sides of the border to celebrate the second birthday of the so-called "Rojava Revolution". Despite Turkish police using tear gas and water cannons trying to stop them, at least a thousand people managed to tear down the border fence and cross over to Kobane to join the still ongoing fight against ISIS. After some more days of fierce fighting, ISIS had to retreat and on July 22, the Kurds started a counter-offensive named "Revenge for the martyrs of Kobane" securing the borders of Kobane canton before ISIS would be able to re-group. 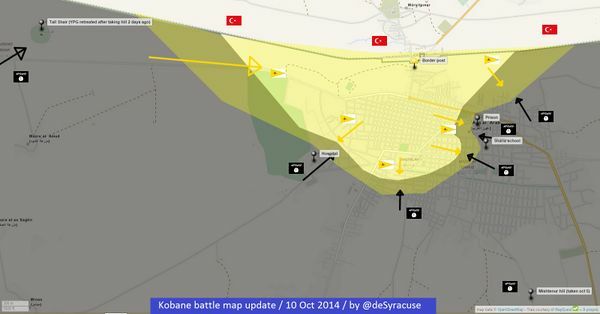 The stated goal of ISIS, to conquer Kobane before the end of Ramadan, had no chance of being reached anymore. 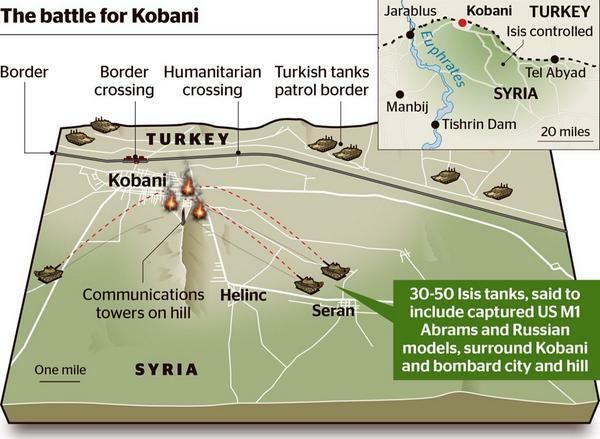 On September 15, 2014, while over in the US a debate on if and how to bomb ISIS positions in Iraq and Syria was going on, and how this could lead to "strange bedfellows", ISIS started their yet heaviest attacks on Kobane from three directions (see above illustration) with tanks and heavy artillery and ongoing support from NATO-member Turkey which keeps the borders open for them. On September 17 several sources report about a train delivering fighters and material to the Turkish side of the border near Tel Abyad, stopping and unloading to the Syrian side in the village of Silib Qeran, which has no train station. Due to the intensity of attacks, the YPG starts to evacuate citizens from villages east of Kobane town, with the latter said to host 600-700,000 people at that time - about three times as much as normal. In the following days the Jihadis continued to advance towards Kobane city and came in distance to shell it with long-range artillery. People started to flee to the Turkish border, where they were stuck and prevented from entering by Turkish military. Only after Western Journalists arrived on September 19 was the border finally opened. People protesting the closed border on the Turkish side had earlier been treated with tear gas and water cannons. As of September 20, 45,000 Kurds have crossed the border into Turkey at eight places, while at least 300 Turkish Kurds crossed in the other direction to join the fight against ISIS. In an interview the Premier of Kobane Anwar Moslem speaks of several trains who have been delivering support and fighters to the approaching forces from the Turkish side, and says many eyewitnesses have seen them. He says he will make them available to journalists if they come to Kobane. At a September 20 press conference in Turkey's parliament, MP Demir Celik claimed that the recipients of the material on the trains were veteran Turkish Special Forces fighting with "the group presented to us as ISIS". He claims to have reliable information that they are the backbone of ISIS' strategical moves from the taking of Mosul to the ongoing attack on Kobane, numbering not less than 2,000 officers "who in the 1990s were cutting off the noses and ears of Kurdish (PKK) fighters". Meanwhile a Turkish nurse went public with a letter to parliament and several media organizations, detailing how she has treated many wounded ISIS members and higher-ups at the private hospital she works at, and now is "sick and tired" of treating people "who chop off heads." She says the people arrive there under false name and are introduced as Syrian "opposition members". Several details are given. "The ISIL commander named Muhammet Ali R. who was admitted to our hospital on Aug. 7 was treated at room number 323. Many of his bodyguards kept watch around the hospital. Many other ISIL commanders like him and soldiers have been treated at our hospital, and returned to war after the completion of their treatment. I don't want to help these people. I want you to inspect these hospitals. And I am referring the owners of the hospital and its management to God." 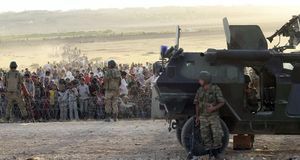 Refugees from the villages of Yapsê and Dinayikê, arriving in Suruç on the other side of the border facing Kobane, report that they have seen a large number of buses approaching the border in the night of September 14, one day before the offensive started. They unloaded what the witnesses claim were "up to 3,000 people with beards and wearing robes" who crossed the border under Turkish military supervision and passed through their villages. These stories together with the fact that the 49 Turkish hostages held by ISIS were released on September 20, and the Turkish government admitted that there has been "a deal", raised questions with many inside and outside Turkey about what exactly this deal might have been. Top PKK officials accuse the AKP government of "selling out Kobane" and threaten to dump the ongoing peace process between the Turkish Kurds and the government. As of September 23, the official number of refugees due to the events in Kobane reached 130,000, with Amnesty International calling on Turkey to keep the borders open and the international community to provide assistance dealing with the crisis. Some Kurdish sources including the PYD head claim that the numbers are vastly exaggerated by Turkey. People trying to return to join the fight after they brought their families over to Turkey are often not allowed back. By September 24 there are reports of 5,000 people trying to return but being prevented to do so by Turkish forces. Some accuse Turkey of having created panic with those huge numbers and reports of Kobane being "evacuated", which made them leave in the first place. They suspect the intent is to "empty Kobane" of Kurds. A September 22 YPG statement reports about casualty numbers in the first week. According to this, 232 ISIS members were killed, four tanks, 13 military vehicles and 7 others carrying heavy weapons destroyed. 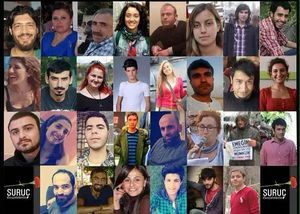 32 YPG/YPJ fighters lost their lives defending Kobane. The ISIS advance on the eastern front was halted, while there was still heavy fighting on the other fronts. A YPG statement from a day later says 84 ISIS fighters had been killed during the last day and their advance halted on all fronts, although intense attacks continued. It is unclear and not mentioned at all if and how much the US bombing campaign, that started in the early morning between the statements and is said to have included strikes on Tal Abyad, influenced the events. 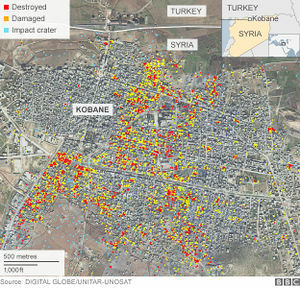 On September 27, the BBC claims that "Islamic State fighters besieging the Syrian town of Kobane on the Turkish border have been targeted by air strikes, reports from the area say", while in reality reports from the ground say that there have been no strikes against ISIS positions by the planes flying over Kobane that day. Once ISIS came into shelling distance of Kobane city, they made use of it to the extent that several rounds of artillery landed across the border in Turkey, which led to the Turkish army positioning dozens of tanks on their side of the border. In the early days of October, the Turkish parliament approved military action in Syria and president and prime minister started to make noises of being willing to do "whatever it takes" to save Kobane. As of October 4, no action was taken and no "coalition" airstrikes on ISIS positions were observed. Meanwhile, reports of Turkish police using tear gas and water cannons against protesters, as well as the military engaging in cooperation with the ISIS militants at the border continued. 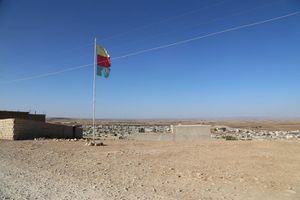 After days without advance but shelling of Kobane town and following promises that they would hold prayer in town on the first day of the Islamic holiday of Eid al-Adha (October 4), ISIS started another offensive on October 2 with concentration on trying to take the strategic hill of Miştenûr overseeing Kobane. According to an October 4 YPG statement, several attack waves were repulsed with 67 ISIS fighters and 10 defenders dead. Following remarks by US vice president Biden about Turkey's role in the rise of ISIS and Erdogan "admitting mistakes" to him about "letting too many people in", on October 4 Erdogan demanded an apology from Biden or he would be "history to me", denying that he ever made those remarks and claiming that "Foreign fighters have never entered Syria from our country". Just hours later, Biden apologized. 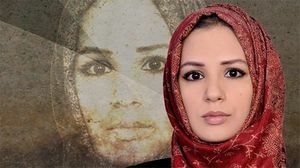 On the afternoon of that day, Kurdish protestors on the Turkish side of the border threw stones at a Turkish TV team after accusing them of biased reporting. In the following riot police assault several Western journalists came under tear gas together with the protesters. Meanwhile, Saleh Muslim, co-chair of the Syrian Kurdish Democratic Union party (PYD), went to Ankara this weekend to hold meetings with Turkish security officials to discuss possible Turkish assistance in defending Kobani against Isis. Turkey’s government has vowed it will not sit idly by and let Kobani fall. If the Turks are unwilling to stop an easily preventable mass slaughter by ISIS on their own doorstep what kind of fractured and riven coalition has Washington actually assembled? And how will this coalition of the disingenuous, the hypocritical and the politically opportunistic ever succeed in bringing peace and stability to the historic cauldron of tribal and religious conflict in Mesopotamia and the Levant that two decades of Washington’s wars and regime change interventions have only drastically intensified? 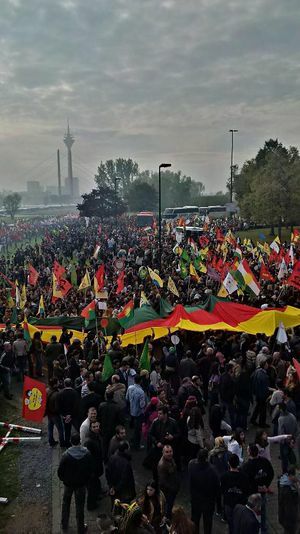 When pictures showing ISIS flags raised on a hill over Kobane and more reports of fighting in the city surfaced in the afternoon, solidarity demonstrations started all over Europe and in many Turkish cities, with some of the latter turning violent pretty quickly. By night, large crowds were for example blocking and marching on the TEM highway in Istanbul. By late Tuesday, at least nine people had died in the heavy and ongoing clashes between Kurds, AKP supporters and the police all over Turkey. After a night in which military was deployed in several cities in Turkey's Kurdish regions to impose a curfew, the death toll had risen to at least 14. An airstrike south of Kobani destroyed three ISIL armed vehicles and damaged another, and another strike southeast of Kobani destroyed an ISIL armed vehicle carrying anti-aircraft artillery. 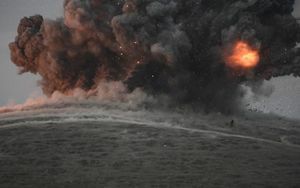 Two airstrikes southwest of Kobani damaged an ISIL tank, and another strike south of Kobani destroyed an ISIL unit. An October 7 YPG statement did not mention the air strikes but several successful operations in direct combat, despite shelling "from three directions", claiming that in the last 24 hours 67 ISIS fighters died while the death toll among the defenders was 12. Statements from the Turkish president and prime minister told the world that "air strikes are not enough" to defeat ISIS and kept making demands that the Syrian Government should be targeted as well before they participate in any coalition. Eight air strikes on October 8 "destroyed five ISIL armed vehicles, an ISIL supply depot, an ISIL command and control compound, an ISIL logistics compound, and eight ISIL occupied barracks, plus damaged another", according to a U.S. Central Command statement. Agreeing with Kurdish sources and contradicting media reports about the fall of Kobane, the statement says that most of the city remains under YPG control. In an interview on Tuesday evening, Salih Muslim said that the strikes had started to become effective on Monday (incidently following his statement that "whoever is going to act, should do so now"), but pointed out that they wouldn't be necessary if only his people would be allowed to buy anti-tank weapons and missiles on the international market and Turkey would open the border gate to make a delivery possible (which he says they had promised him to do days ago in Ankara) and/or stop their assistance to ISIS. Like with the Kurds protesting in Turkey and all over Europe, these are the demands, contrary to what some Western media make it look like: that anybody wants Turkey to invade Rojava. In three October 11 interviews with the Kobane canton premier minister Anwar Moslem, foreign minister Idris Naasan and PYD co-president Asya Abdullah, the latter from Kobane city, the officials called for a corridor through Turkey for humanitarian aid and weapons. While the fighting morale is said to be high and they think to be able to defend the city center "for months", all report that there are still many civilians in Kobane and the ISIS gangs now control water and electricity supply. According to Asya Abdullah, ISIS presses local Arab youths in the regions they control into coming to Kobane as reinforcements, promising booty. Which leads to high casualty numbers among the untrained fighters. She calls on Arabs and all other groups in the region to not allow ISIS to "destroy the fraternity of peoples". International voices like UN Office for the Coordination of Humanitarian Affairs Under-Secretary-General Valerie Amos and UN Special Envoy for Syria Staffan de Mistura joined the choir demanding immediate aid for Kobane. 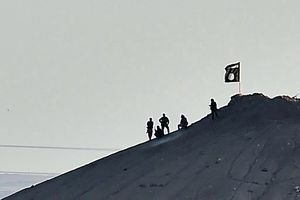 After a week with intensified and thanks to better coordination between YPG and the US-led "coalition" more precise air strikes, some recently lost territory was gained back from the ISIS gangs and a hill outside town was captured, with the larger Miştenûr hill still in ISIS hands. Even while still no weapons had reached the Kurds and ISIS got reinforcements from other parts of their controlled territory, a YPG commander said on Friday, October 17, that the initiative was now with them. In the night to Monday, October 20, for the first time weapons, ammunition and medical supplies were delivered to Kobane in multiple airdrops by a US Military C-130 plane. The weapons were supplies originally delivered to the Kurdish Regional Government in Iraq, which gave the go-ahead to divert them to Kobane. According to a Turkish Foreign ministry statement on Monday, Turkish airspace was not used to carry out the airdrops, but Foreign Minister Mevlüt Çavuşoğlu claimed that Turkey "is" facilitating Iraqi Kurdish peshmerga forces to cross into Kobane. On the same day he was allowed to prominently express his urge to topple the "Syrian regime" in The Guardian, calling on the international community to make "good prevail over evil" (Turkey over Syria, that is). This is a story that takes one to Urfa, a city that is linked to Syria through the border crossing at Akçakale. At Urfa’s Balıklıgöl State Hospital, evidence for the treatment of Islamic State fighters is not camouflaged – it is there in plain sight. The Islamic State wounded from the battle of Kobane cross over for treatment here. [...] Barzan Iso, a Syrian Kurdish journalist, had already reported that Qatari charities have been using the Jarabulus crossing to get aid to the Islamic State. I had also reported on this but did not have any evidence that trucks with logos from international organizations were being used for this purpose. Asked about the airdrops and Erdogan's remarks about the PYD being a terrorist organization no different from PKK (and ISIS), State Department deputy spokesperson Marie Harf insisted that "the PYD is a different group than the PKK legally under the United States law" (PKK is listed by the State Department as a terrorist organisation since 1997. PYD is not on the list). Following their reinforcements of the weekend and the US airdrops, ISIS attacked with full force on Monday, maybe to use the opportunity before any of the Turkey-announced Peshmerga reinforcements could arrive. A YPG press release on Tuesday evening speaks of 11 dead defenders and over 70 dead attackers on several fronts in the last 24 hours, including two foiled attempts at the ISIS speciality of suicide car bombings. On Wednesday Hürriyet reports that the Iraqi Kurdish Regional Government had decided to send 200 Peshmerga fighters with heavy weapons to Kobane, following the Turkish green light. By Sunday, October 26 Peshmerga sources clarified, contradicting media reports, that there was still no date and time for a deployment set, while the attackers had again received reinforcements and fierce fighting was going on on all fronts. As in July, there had been rumours and reports about the use of chemical weapons in the recent attack wave before, but on October 22, information about an alleged use of chlorine gas was coming out of several sources and found more widespread coverage. According to among others PYD co-chair Asya Abdullah and Dr. Walit Omar, both speaking from Kobane, at least eight civilians and an unspecified number of fighters had been treated with symptoms indicating the use of those weapons by the attacking forces. The head of SOHR claimed to know that these reports are false and it was only an allergic reaction of one person due to large amounts of smoke created by bombardments. On October 27, a video appeared showing alleged ISIS hostage John Cantlie reporting from what rather plausibly looks like a quite calm Kobane, claiming that contrary to Kurdish and Western media reports, ISIS was in the process of mopping up and the fight in Kobane almost over. Shortly after publication, Dubai Al Aan TV reporter Jenan Moussa, who has been reporting from the Turkish side of Kobane border for weeks, tweeted a video allegedly showing a recent tour of Kobane city center with Kurdish fighters. In the morning of Wednesday, October 29, a group of FSA-affiliated fighters crossed the border from Turkey into Kobane with eight pick-up trucks. Already waiting at the border was a group of 85 Peshmerga who had flown in from Iraqi Kurdistan. They were waiting for another 65 Peshmerga fighters who went on the trip by road with the equipment a day earlier. They were expected to cross into Kobane together later. Meanwhile, airstrikes continued. In an op-ed published in the New York Times the day before, YPG commander Meysa Abdo asked the international community to pressure Turkey into allowing the obvious measure they were still preventing: Forces from the other two Syrian Kurdish enclaves to reinforce their comrades in Kobane with fighters and equipment. According to SOHR, "about 10" Peshmerga entered Kobane on Thursday. By Saturday the whole 150 fighters strong Peshmerga group had crossed into Kobane and their general commander, Liwa Ebdulqahir, said at a joint press conference with the YPG that "our enemy has brought us together" and expressed hope that this would be the beginning of a "national army" of all Kurdistan. Coordinated attacks started the following night with reports that the ISIS positions around Kobane town had been attacked with Katyusha rockets, and on Monday, November 3, it was reported that to the West of town "the villages of Arbus, Manaza, Albalur and Cikur were cleared of ISIS members in the morning". Also participating were FSA-affiliated fighters under Burkan al Firat (Euphrates (Kurdish: Firat) Volcano), a joint operations room formed in September between the YPG and Arab brigades from Raqqa province with the explicit goal of taking back the region from ISIS. In a joint press conference by YPG and Peshmerga on November 8, it was claimed that over 3,000 ISIS fighters had been killed in the events since September 15. 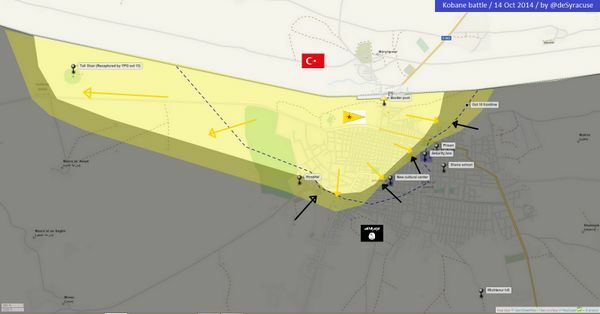 On November 11, with gains by the defenders inside Kobane town and operations in villages as far as bordering the Euphrates river announced by the YPG, and confirmed by the SOHR who also reported about increasing demoralization effects among ISIS due to over 50 days of failed attempts to conquer Kobane, the attackers resorted to attacks on civilians which caused 8 deaths and 19 people wounded by sniper attacks, tank shelling of the city center and mortar shelling of the refugee camp close to the Turkish border at Tal Shaeer. 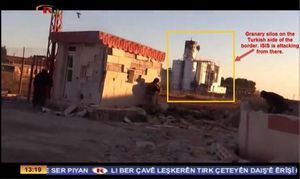 Screenshot of Kurdish TV report showing attack from silos on Turkish territory. Kurdish Television aired video snippets from the border gate showing YPG fighters defending against the attack coming from the grain silos on Turkish territory. According to several statements by alleged eyewitnesses published by Firat News Agency, Turkish armored vehicles have been on the scene and near ISIS fighters during the suicide car bombings and the following fights. According to another report, one hour before the attacks started, the power supply on the Turkish side was cut. Reportedly it has emerged that Suruç Electricity Unit administrators told workers that the electricity supply would be cut in the morning between 04:00-05:00 and said "the information came from above". It is stated and corroborated by a report in Turkish paper Özgür Gündem that the Governor of Urfa province, İzzettin Küçük, has admitted at a meeting with HDP MP İbrahim Ayhan that ISIS has fighters in Turkey and is attacking Kobanê from the Turkish side of the border, contradicting the denials coming out of Ankara. According to a YPG statement from November 30, the clashes went on into the night, before 35 ISIS fighters fled from the silos eastwards along the Turkish side of the border. In addition to the suicide bombers, 15 attackers were killed. The bombings themselves killed 11 fighters of the YPG, 1 of the Shamsi Shîmal, 1 asayesh (security units) officer and 3 civilians. The statement also reports about a successful offensive in the south of the town, which liberated the East Botan neighbourhood and during which three ISIS tanks were destroyed. It is claimed that on all fronts combined 83 ISIS fighters were killed during the last 24 hours. On December 1, Erbil-based news agency BasNews reports that another 150 Peshmergas are about to be send to Kobane to replace the first group of fighters. This is planned to happen "according to an agreement between the US, Turkey and the [Iraqi] Kurdistan region" once a month, for three months total. 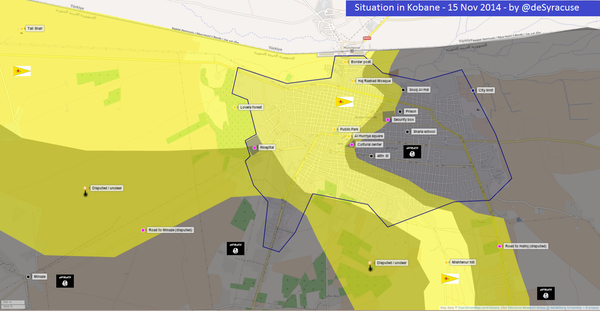 The report says that according to a Peshmerga fighter in Kobane, only 25% of the town remain under ISIS control. The U.S. Air Force conducted 17 airstrikes on ISIS positions in Kobane between November 28 and December 1. 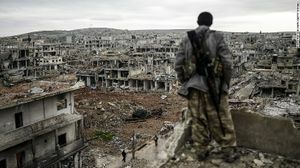 According to reports from the ground, a strong smell of death has developed in the eastern part of Kobane due to the large amount of corpses decaying, many under destroyed buildings, and the inability to remove them. Meanwhile, ISIS fighters set on fire hundreds of cars left by refugees on the border in an area under Turkish military supervision. They were left to burn out with nobody intervening. In an operation that took five days, on December 7 the Kurdish forces "entirely liberated" the Botan neighbourhood in the south of the city, cutting off a supply line for ISIS. Among the killed ISIS fighters were "experienced foreign units" including a leader called Abu Hamza, who was so important to his men that they tried several times to rescue him. According to Sedat Sur reporting from Kobane, "the Botan operation has initiated the phase of victory in Kobanê for the YPG/YPJ." According to Central Command data, out of 559 air strikes it did in Syria in 2014, 76,6% (428) of them struck Kobane, killing about a thousand ISIS fighters. Kobanê town of West Kurdistan, Rojava, has been cleansed of ISIS and liberated after 134 days of attacks by the gangs. The people in Kobanê have started celebrations. According to Jenan Moussa on the same day, "ISIS is out of Kobane city yet still in countryside. East: ISIS is 2 to 4kms away (depending who u talk to). West: 4 -8kms. South 2 -3kms." According to a Peshmerga twitter account, the offensive to liberate Kobane canton reached the banks of the Euphrates river on the western front on February 8. According to the head of Kobane canton, Anwar Muslim, 80% of the buildings in Kobane city have been destroyed. Efforts for reconstruction are on the way, with the Confederation of Revolutionary Trade Unions of Turkey alone having 12,000 volunteer workers ready. An initial assessment of the satellite pictures by the UN's Operational Satellite Applications Programme (Unosat) shows that 1,206 buildings were destroyed and 1,169 severely damaged across the town. A total of 979 impact craters have also been identified within the town and its immediate surroundings. The satellite images were taken on 22 January and compared with images from 6 September 2014. In an interview Mutlu Civiroglu conducted with a number of officials organizing the reconstruction, it was said that only 3 of the 13 schools in Kobane are still standing. Bank accounts for donations are in the process of being set up, and some help has already arrived, also from international organizations who want to assess the situation. A lot of it didn't make it all the way to Kobane though, because Turkey is still tightly controlling the border crossing and letting only foodstuff and returning refugees in. The officials called on the international community to put pressure on the Turkish government to stop "creating problems". By early March, ca. 15,000 residents did return to Kobane. While around 300 corpses of ISIS fighters had already been removed from under the rubble of parts of the town, every day more were found and the people organizing the reconstruction were asking for help from specialists to deal with this problem before warmer weather would even increase the danger of diseases spreading. By May, almost all of Kobane canton had been taken back from ISIS. 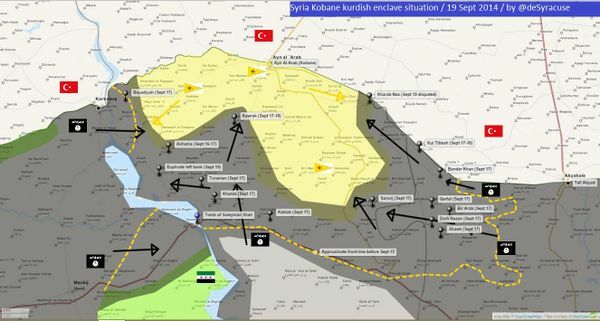 An offensive was started to close in from West and East on Tel Abyad (Kurdish: Girê Spî) with its border crossing of strategic importance and to connect the Kurdish enclaves Kobane and Jazeera. By Sunday June 14, the mixed Kurdish/Arab forces of Burkan al-Firat had reached the outskirts of the town. In the evening, rumors on twitter said that the forces from both sides had already met south of town and therefore cut it off from its supply lines to Raqqa. On Monday Turkey opened the border for a couple of hours and let civilians fleeing the fighting pass, while others were forced back into town by ISIS fighters likely to be used as human shields. The offensive advanced completely encircling Tel Abyad and according to Kurdish sources took over the border post a kilometer to the north. 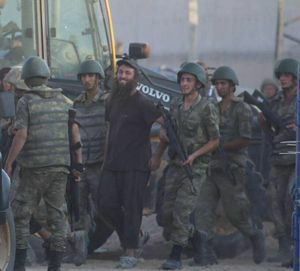 In mid-August Firat News Agency published an interview with Turkish ISIS fighter Mahmut Gazitatar who was captured alive in the operation. In addition, another, mainly Arab group took over the town and traffic hub of Ayn Issa twenty kilometers south of Tel Abyad in the direction of Raqqa. These gains came after at least 26 villages had been taken over during the weekend. Anti-ISIS activist and Raqqa native Abu Ibrahim stated to German newspaper DIE WELT that "during the whole offensive the Kurds hadn't much to do. There were few fights because the (coalition) fighter jets destroyed all the IS positions from the air". 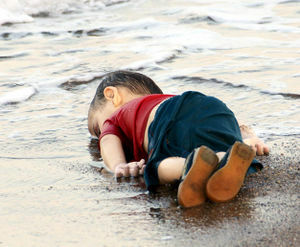 Aylan Kurdi, the 3-year-old who drowned in September 2015 while trying to escape from Turkey to Greece was from Kobani. 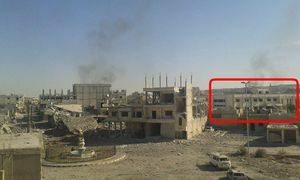 In the early morning hours of June 25, a number of cars with about three dozen ISIS fighters arrived in Kobane, exploded one or more car bombs and started to randomly shoot civilians at several places like the hospital and a mosque. In the afternoon the death toll had reached 42, with many more wounded. 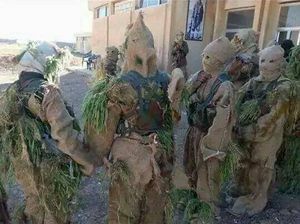 Locals reported that the gangs had crossed through the border from Turkey, with versions claiming that they were shaven, dressed as FSA fighters, or even wearing Turkish military uniforms. Turkish officials called allegations that they had helped the gangs in any form "lies". By the next morning the casualties had risen to at least 152 dead and 180 wounded. 80 people who had been taken as hostages and used as human shields were rescued, but by afternoon clashes with gang members continued in five different locations in the city and surrounding villages. 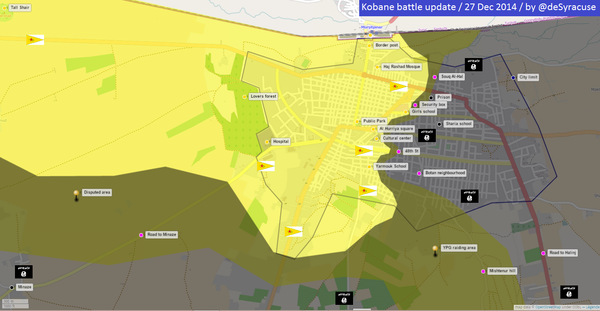 According to Kurdish sources, by noon June 27 Kobane city was fully cleansed of the attackers, with 60 of 70 dead. Those that were encircled at the Hospital had blown themselves up. By that time, 201 citizens of Kobane were dead and 249 wounded. On July 20, a gathering of activists of the Socialist Youth Associations Federation in the garden of the Amara Cultural Center in the Turkish town of Suruç, just across the border, meeting to deliver collected material aid and reconstruction work to Kobane, was blown up by an apparent suicide bomber, leaving at least 32 people dead and over one hundred wounded. According to government officials, the attacker was identified as a 20 year old Turkish national who went to Syria a year before. Despite the attack, the survivers crossed over to Kobane and realized a first project on July 22: 250 trees were planted on Kanîya Kurda hill where much of the fighting has taken place. Originally planned to commemorate all who died in the defense of Kobane, it now will be known as Suruç Martyrs’ Forest. In the aftermath of Suruç, Turkey started raids of "IS and Kurdish militants" and attacked ISIS targets over the border with artillery, tanks and F16 bombers. After having been reluctant for months, they finally allowed the US-led "coalition" to use Incirlik NATO airbase for flying attacks in Syria. 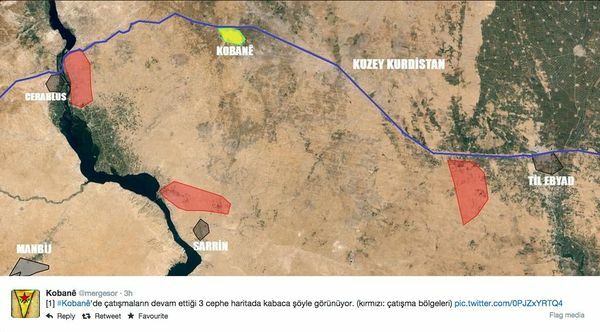 According to Hürriyet, the deal includes the installation of a "partial" no-fly zone that runs on a "90-kilometer line between Syria’s Mare and Cerablus [and] will be 40 to 50 kilometers deep". Turkish and US jets are supposed to provide "security" "when needed" while Syrian jets would be "not permitted" and "targeted" if they show up. The described zone directly borders or reaches into Aleppo. In a letter to the UN, Turkey claimed self-defense, article 51, as justification, with their UN ambassador explaining "It is apparent that the regime in Syria is neither capable of nor willing to prevent these threats emanating from its territory." They soon announced first strikes on IS positions in Syria and on PKK Kurdish positions in northern Iraq. The US State Department's spokesman Mark Toner answered "no" when asked if a no-fly zone is about to be imposed over northern Syria. According to anonymous western officials talking to the British press, in the raid on the ISIS "oil minister" Abu Sayyaf plenty of evidence was discovered and recently examined that makes "direct dealings between Turkish officials and ranking Isis members [...] now “undeniable”. The YPG representative to the US-led "coalition", Polat Can, stated in an interview with the Washington Kurdish Institute that "according to reliable information that we have recently obtained, Erdogan’s daughter (Sümeyye Erdogan) oversees the committee handling the treatment of ISIS terrorists in Turkish hospitals." On July 28, PYD co-chair Saleh Muslim claimed in an interview that the Turkish airstrikes against ISIS had only been cosmetic and the real target was the Kurds. Bombings of targets in Northern Iraq and increasingly in Turkey itself indeed had intensified as reported in detail by HPG (the military wing of PKK). Meanwhile, the YPG/YPJ forces successfully ended their offensive revenging the massacres in Kobane and Suruc, liberating the last stronghold of ISIS in Kobane canton, the town of Sirrîn located 45 km south of Kobane town on the banks of the Euphrates river. This happened under close coordination with the US-led "coalition" who targeted the fleeing ISIS fighters with air strikes. By the end of the week, statements directly contradicting each other kept coming out of Ankara and Washington concerning the "deal" about the US use of Turkish bases. Not only did Washington representatives insist that no kind of "safe zone" has been part of the agreement, but on Thursday, July 30, a speaker of the US State Department explicitly said that they will use the Turkish bases for continued support of the YPG, while one day earlier a spokesperson of the Turkish foreign ministry had claimed that YPG is excluded from the groups the US would be allowed to support from their bases. By mid-August, the US had deployed six F-16 fighter jets and about 300 army personnel to İncirlik airbase and flown first missions. The Turks were still not taking part in this, while their airstrikes on PKK targets in Iraq and Turkey continued. A Pentagon spokesperson said that they would join after negotiations were finalized and an air tasking order implemented. After this happened on August 24, the Turkish Foreign Ministry announced on August 29 that they had started to carry out air operations against ISIS and had struck seven targets in northern Aleppo province with two times two planes in the last 24 hours. This happened while ISIS was on the advance again, taking villages from so-called "moderate" Al Qaeda affiliates and closing in on the town of Mare that was named as the western end of the "safe zone". ↑ Foreign Terrorist Organizations (FTOs) are foreign organizations that are designated by the Secretary of State in accordance with section 219 of the Immigration and Nationality Act (INA), as amended. ↑ IŞİD, Kobani’ye Türkiye’den saldırdı: Saldırı geri püskürtüldü, snippet from Kurdish TV uploaded to DailyMotion on November 29 shows scenes at Kobani border gate south-west of the grain silos on Turkish territory from where the attack comes. This page was last edited on 8 March 2016, at 20:59.